AMU 2019 Application Form Correction – Candidates who have submitted the application form for AMU 2019 can edit mistakes in their forms within a limited period of time. 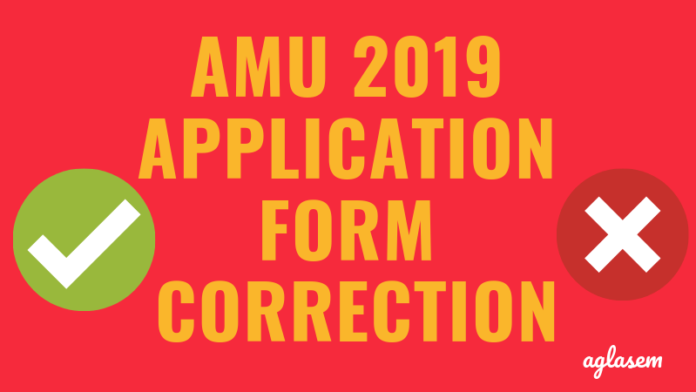 AMU 2019 application form correction will be held in March 2019. The exact dates have not yet been released by AMU. WE will update this page accordingly, as and when the date have been released. In this time, anyone who has applied can log in and change any of the five entries listed below. Most queries on form corrections were on these fields only. Therefore Aligarh Muslim University is allowing corrections in these fields. As per last year’s data, a candidate was able to rectify the following details. Candidates are advised to create new user login, fill the form and pay of the processing charges. 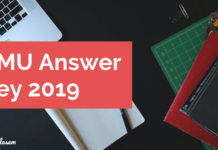 How to make corrections in AMU 2019 form? In order to make corrections in form, candidates need to login. The login link will be available here on this page on the assigned date. Once it is available, you can execute these steps to edit mistakes in AMU 2019 application form. Click on the form correction link. Now you will reach a login page. Here enter user ID and password. Once you are logged in, edit details. Check that everything is correct and submit form. Candidates are requested to note that Aligarh Muslim University will not entertain offline correction requests. Also, after last date mentioned above, no correction can be done. Application form submission for AMU 2019 admissions will be available soon. After the successful registration, there will be entrance exams for admission to various courses. All applicants will be able to appear in entrance exam on basis of details they have filled in form. For this reason, and also because your candidature details depends on form, it is important to make sure that everything is correct in AMU 2019 admission form. Aligarh Muslim University will issue admit cards for each candidate. Admit cards for each entrance exam are released one by one. Usually, admit card/hall ticket of AMU entrance exam becomes available at least one or two weeks before the exam. 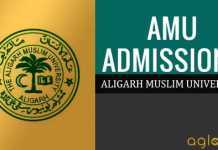 Download AMU admit card 2019 here. When it is available, the candidate has to login using user ID or transaction ID. It is necessary to have admit card in person on the day of the exam. Only then one can cross the threshold of the exam center and enter to give the exam. Make sure to correct all details in your application form. Final details will reflect in your admit card and result. form correction window will start soon. Can I correct my religion in amu correction form. In place of Hindu by mistake only H was written. And what if I don’t correct is there any problem? No, you cannot change the religion. In place of Hindu only H was written, Is it considered correct please reply If you know something about this. No, you cannot change the thumb impressions. sir how to change roll no of intermediate examination??? well you can’t change the enrollment number. yes you can edit your application form. Is amu application form correction is released. If yes then please provide the link. Apne kya course select kiya hai. Please…..Provide the link for correction in amu application form. sir i have applied for btech and mistake in date of birth .correction march me hona tha but ab tak nahi hua.kab release hoga . The correction form dates have not been released yet. How can I check my btech form Is submitted. You will get the confirmation about the same on your mobile number or email-id. Kab aayega change krne ke liye details ?? ayega correction form abhi koi notification ni aayi. abhi date release ni hua correction form. Beta koi bhi notification nhi aayega jaa ke unhe phone kro wo tumhe sahi raasya dikhayenge. Humne bhi aaishi kiya hai e-mail krne ko bola tha unhone. Sir i am applying for 11 class and unfortunately entered wrong board roll number .What to do now? Can I change my email id that is given ? Please let me know ,how can I get important updates related to Btech entrance exam and admit card.